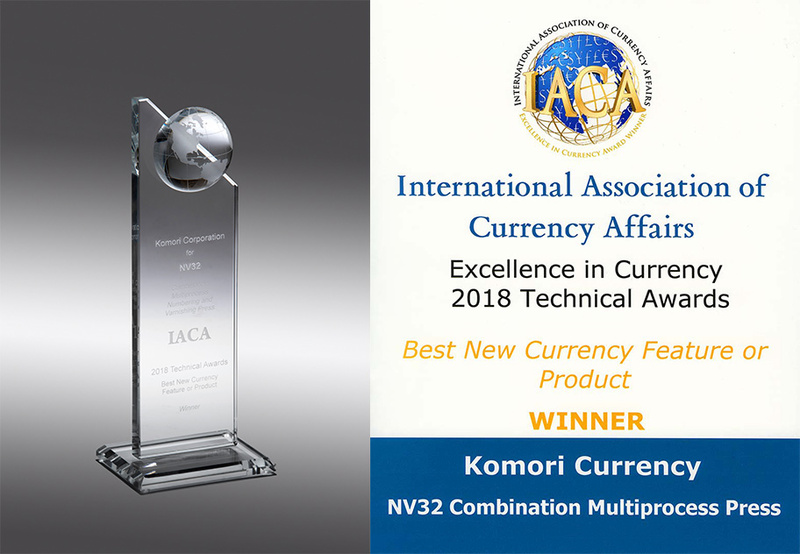 Komori Corporation(Sumida-ku, Tokyo; President, Representative Director and COO: Satoshi Mochida) has announced that the Komori CURRENCY NV32 Combination Multiprocess Numbering and Varnishing Press for banknote printing has been awarded the 2018 Excellence in Currency Technical Award for the Best New Currency Feature or Product by the International Association of Currency Affairs (IACA). The following is an outline. The Komori CURRENCY NV32 Combination Multiprocess Numbering and Varnishing Press for banknote printing has been awarded the 2018 Excellence in Currency Technical Award by IACA. Inaugurated in 2014, the IACA Excellence in Currency Technical Award is a prestigious prize given to the technical development that is predicted to have a major influence on the banknote printing industry. In 2018, five finalists were selected from 24 nominees. Although the finalists included anticounterfeiting technologies developed by state and private printworks, Komori received the award as possessing the most outstanding technology of the five final entries. The CURRENCY NV32 is a revolutionary banknote printing system offering two significant advantages: maximizing uptime and strengthening banknote design capability. With a maximum printing speed of 12,000 sph and the PQA-N Print Quality Assessment System for Numbering, the press performs number printing, the final process in banknote printing, with stable print quality at high speed. Moreover, it is capable of applying special varnishes on both front and back sides, contributing to improved banknote durability. The CURRENCY NV32, based on the MED concept, is capable, for example, of adding units that apply two different varnishes on the front and back sides and performing number printing on both sides, thus enlarging banknote design capabilities without limit. In addition, each printing unit is equipped with an independent drive motor and clutch, enabling simultaneous parallel job changeover operation, thus achieving makeready time shortened by more than 50 percent compared to a conventional system. For number printing, UV curing can be selected, enabling smooth transfer of banknotes to the next process and making the banknote printing process exceptionally efficient.